When a young girl can’t go to school she is more vulnerable to violence, poverty, and disease. But it doesn’t just hurt girls: it affects their families, their communities – even their countries. WOULD YOU WANT THIS FOR YOUR DAUGHTER? Barely enough food to eat. The only clothes she owns are those on her back. Forced into marriage before her teenage years. Living a life of servitude to her husband and in-laws. As devastating and incomprehensible as this might sound, all of these examples represent the sad, frightening reality for thousands of young girls in the poorest parts of rural India. An educated child is one who can develop, thrive, and prosper. An educated child is one who can break away from the anguish and emotional abuse that awaits so many of these innocent young girls. The sad truth is that most families in the most indigent parts of India must make a choice about which of their children will attend school — and, most often, it’s the daughters who lose out on the opportunity for an education and, along with it, access to a future of hope, promise, and aspiration. The It Starts With a Girl initiative provides free education to over 4,000 girls each year, from primary school through college, changing their lives in the process. In rural India, educated women have much higher access to economic opportunities and possess a higher influence in their households and communities. Additionally, educated women are less susceptible to violence, and they are more likely to have access to medical care and a healthy lifestyle. With your donation to It Starts with a Girl initiative, we are breaking this cycle of poverty for these girls – young women who soon will become future mothers and leaders who understand and value the importance of a strong education. Our objective is to bring about important social changes by establishing a strong educational foundation for young minds. 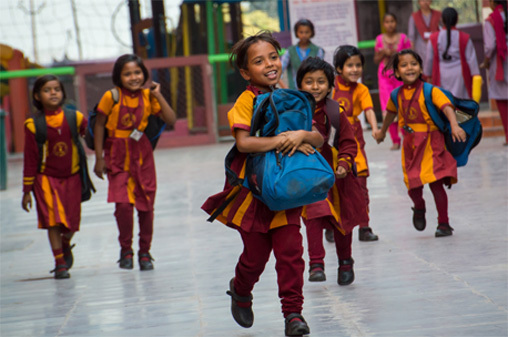 Today, we are one of the most successful comprehensive Girls’ Empowerment Through Education programs in India. But, we can only continue our important mission with the help of generous donors like you. PLEASE NOTE: 100% of your donation goes directly to helping these young women in need. 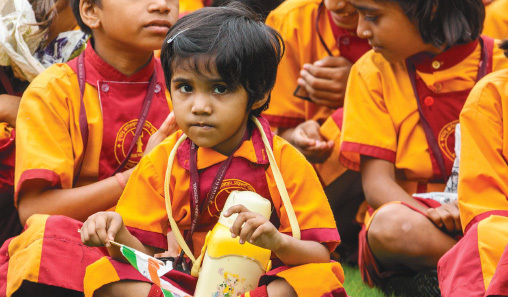 VSK FOUNDATION’S It Starts With a Girl initiative supports Kripalu Schools (JKP) (Kripalu means “gracious” and “generous”), a completely volunteer-run organization that operates charitable institutions that support the education, empowerment, and nurturing of girls in impoverished areas. These institutions are situated in a rural town called Kunda, in Uttar Pradesh, India. Children living in and around this area, especially girls, are deprived of opportunities to receive even the most basic education. The free education Kripalu Schools are able to offer has become a guiding force in the educational awakening of underprivileged girls living in this region. Their students pay no fees and receive free uniforms, school bags, and other school-related requirements – removing the major poverty-induced obstacles to their education. By providing an education that will actually make a difference to their students’ lives, they allow them to acquire the knowledge that not only will enable them to develop the skills and qualities needed to change their own future, but also change the future of their families, as well. Kripalu Schools 100% charitable institutions are uniquely successful in empowering women, because their solutions are all-encompassing and comprehensive. Their programs nurture and educate young women from pre-school through college and post-graduate degrees, while also improving their home-living circumstances and overall quality of life. Born in Kunda, Manjusha spent her childhood in a small mud house with her grandmother, parents, sister, and brother. Her father, the sole provider for the family, earned $50 a month as a tailor. Manjusha, a very quiet and shy girl, always dreamed of being able to help her family live a better life and had a sincere desire to gain an education. She completed her primary education at a local village school; due to the financial limitations of Manjusha’s family, she could not have continued with her studies if not for the free education provided by the It Starts with a Girl initiative. Manjusha graduated at the top of her class, and excelled in her 12th grade State Board Exams. Manjusha then continued with the Bachelor of Arts program (BA) at Kripalu Schools. 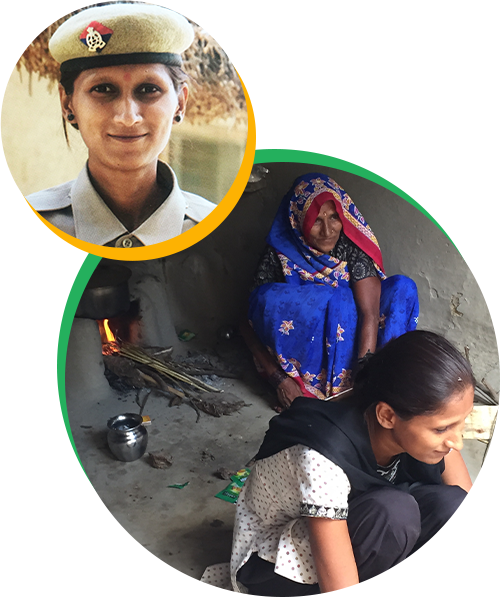 A few weeks after completing her studies, she applied for and was selected as a constable in the Indian Police force. 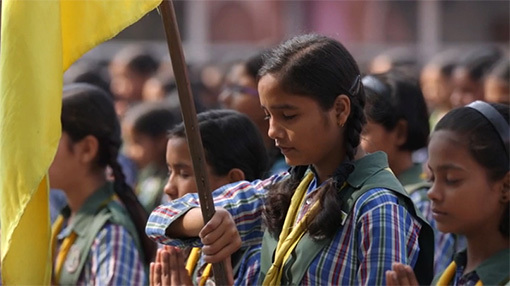 Manjusha says that she owes her education and success to Kripalu Schools, as her family would not have been able to afford her schooling without the assistance these institutions provided. She also believes that the free education, school supplies, and other necessities provided by the organization allowed her to enjoy a future that otherwise would never have been available. Manjusha sends her heartfelt gratitude to the teachers, staff, and donors, with plans to visit the schools regularly to inspire other students and help them fulfill their dreams. 2016 Indian ICON Award for exemplary charitable service in the education of girls. 2015 Zee Sargam Award for constant efforts in empowering women through free education. 2015 UP State Mahotsav Award for charity in health and education. 2014 All India Dalit Muslim Morcha Award for laudable efforts to educate girls, irrespective of any student’s religion, caste, or creed. 2013 Mother Teresa Excellence Award, instituted by Non-profit Economic Growth Society of India for exceptional work in the field of education. 2013 NARI Today Award by INext for extraordinary work done and remarkable contribution made in the field of female education and social charities. 2013 NELSON MANDELA PEACE AWARD for selfless contribution to society. 2013 Zee Sargam Award for social service and education of girls. 2012 Rajiv Gandhi Excellence Award, noted as India’s highest honor for outstanding achievements in charity, in May 2012. Primary school established in 2005 – Nursery to 5th grade. Intermediate College established in 1978 and transferred to our charitable organization in 2007: 6th -12th grade. Graduate and Post Graduate College founded in 1998; at present, offers degrees in science, arts, and education. Vocational school under construction, which will provide skills in specialized trades, such as sewing, cosmetology, and bakery.